And no one else had garish teddy boy suits quite like theirs either. Legendary comedy double act Francie and Josie, played by Rikki Fulton and Jack Milroy, first appeared four years earlier in live stage revue The Five Past Eight Show, where the great Stanley Baxter had taken the role of Francie. Rikki was sceptical at first and even bemoaned having to spend money on a new suit, wig and shoes – which he feared would be thrown in the back of a cupboard if the act didn’t turn out to be successful. He needn’t have worried – the pair’s greeting “Hellawrerr, chinas!” quickly became a classic Scottish comedy catchphrase. The characters – Francis McKenzie and Joseph Tiernan, to give them their full names – were meant to be a pair of daft Glaswegian wide boys sharing their street philosophy to theatre audiences. 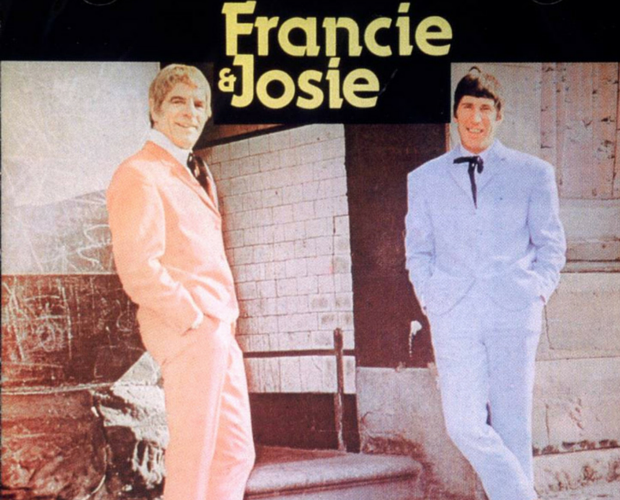 But once Francie and Josie appeared on television their music hall act went national – and even helped fuel a craze for televisions throughout the country. The hunger for their show was so great it regularly beat soap favourite Coronation Street in the ratings. It was picked up for broadcast in Northern Ireland and north east England. Rikki and Jack were even employed to go out to TV rental shops dressed as Francie and Josie, in a bid to encourage people to rent television sets. The first appearance, in Airdrie, was so busy that the crowds accidentally smashed the shop windows in their attempts to get close to the pair.